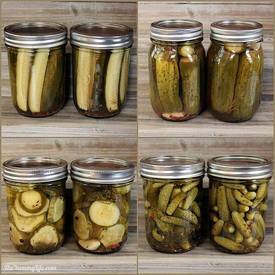 One awesome recipe for any size or shape pickle! An easy recipe for refrigerator pickles or canning whole, minis, spears, or coin-shaped pickles. Dill pickles are surprisingly easy to make. This recipe from The Yummy Life has the right balance of tangy, salty, garlicky, dilly and with just a touch of heat. These are especially fast to prep as a refrigerator pickle. If you want them to be shelf stable for an extended time, this recipe is also suitable for canning.